Manchester United are lacking in “mad dogs” in midfield, manager Jose Mourinho said after his side recovered from a terrible start but were still held to a disappointing draw at struggling Southampton. Mourinho’s side were facing an embarrassing defeat early on as the Saints went into a 2-0 lead inside the opening 20 minutes. Marcus Rashford inspired a comeback before half-time, with two goals in six minutes from Romelu Lukaku and Ander Herrera earning the visitors a point, but it was another unconvincing display. Mourinho – who played two midfielders in a back three because of injury problems – bemoaned his side’s inability to take control of the match. “It doesn’t matter the system we play,” Mourinho said. “(Not winning) has to do with the characteristics of the players. Neither side were able to mount any real pressure in the second half, with the draw leaving the Saints in the relegation zone in 18th with just one win in their past 15 Premier League games, including last season. Mark Hughes’ side will reflect on a costly capitulation at the end of the first half after fine goals from Stuart Armstrong and Cedric Soares had seemingly put them in control. On the face of it, this is a bad result for a Manchester United side harbouring hopes of a top-four finish – but it could have been worse, as a Southampton side with just one league win all season punished a sloppy opening. United have spent hundreds of millions of pounds under Mourinho but not for the first time this season started with a makeshift defence. Midfielders Scott McTominay and Nemanja Matic started in a back three, with Marcos Rojo only deemed fit enough for a place on the bench. McTominay and Jones seemed to be in each other’s way in the build-up to the opener, as Republic of Ireland youngster Michael Obafemi rolled the ball into Armstrong’s path, and the former Celtic man drilled a fine strike across David de Gea and in. 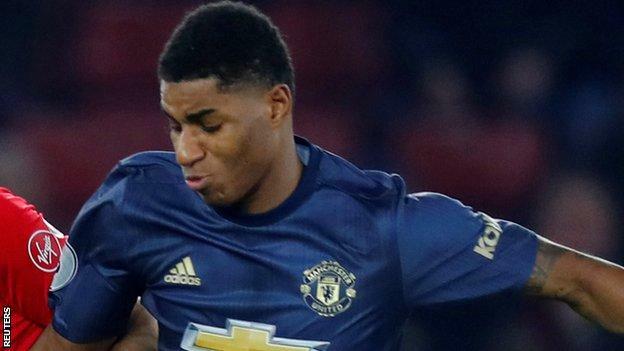 Southampton had scored with their first attempt of the match, and added a second shortly after when Rashford made a rash challenge on the edge of the area and right-back Soares marked his 100th Premier League appearance with a first goal, brilliantly curling beyond De Gea from 20 yards. United looked listless, but found the inspiration they were badly lacking in Rashford. First the 21-year-old collected a long ball, bounced through a half-hearted challenge from Maya Yoshida and laid a chance on a plate for Lukaku. Even without a club goal in 12 games and nearly three months, the Belgian couldn’t miss. Rashford then did even better shortly afterwards, beating three defenders on a surging run into the penalty area and finding Herrera at the near post, the Spaniard providing a clever backheeled finish under Alex McCarthy. But that was where the excitement ended for United. In a largely lifeless second half their only shot on target was a tame overhead effort from Paul Pogba, and Mourinho’s already stretched squad saw Luke Shaw, Rashford and Lukaku limp off late on, while Ashley Young picked up a fifth booking of the season which rules him out of Wednesday’s league game at home to Arsenal. “I would say Marcus Rashford was a mad dog,” Mourinho added. “He was, let’s say, very, very tired with little problems. That appetite, that desire, that fire that you have, you need that to recover the ball faster and to recover the ball higher on the pitch, but these are just details. Hughes said that he was “really pleased” with the point, but the former United forward has now won just three of his 21 league games in charge of the Saints, who stay in the relegation zone on nine points. They have now squandered a league-high 12 points from winning positions this season, a statistic that could have telling consequences later on in the season. The hosts were the better side in the second half, with the impressive Nathan Redmond forcing De Gea into a sharp save from long range, but they never really looked like forcing a much-needed winner. “When you look at our performance and the table, we are not where we want to be. Are we under-performing compared to last year? Probably not,” Hughes said. Manchester United midfielder Ander Herrera said: “We should forget right now about the table, we should try to win every game. That’s how we will reach the top four. “We should approach the Arsenal game like a final. Southampton remain the only team in the Premier League yet to win a home game this season (D5 L2). Mark Hughes has won just three of his past 25 Premier League games as a manager in the competition (W3 D9 L13). Cedric Soares is the seventh player to score a direct free-kick for Southampton in the Premier League and first since James Ward-Prowse versus West Brom in February 2018. Romelu Lukaku’s strike versus Southampton has ended a run of 12 games and 981 minutes without a goal for Manchester United in all competitions since netting against Watford in September. It doesn’t get any easier for Southampton, who travel to Wembley to take on Tottenham on Wednesday (20:00 GMT). Mourinho and United host old foes Arsenal on the same evening, also 20:00. Match ends, Southampton 2, Manchester United 2. Second Half ends, Southampton 2, Manchester United 2. Stuart Armstrong (Southampton) is shown the yellow card for a bad foul. Ashley Young (Manchester United) wins a free kick on the left wing. Foul by Stuart Armstrong (Southampton). Attempt missed. Manolo Gabbiadini (Southampton) left footed shot from outside the box is too high from a direct free kick. Manolo Gabbiadini (Southampton) wins a free kick in the attacking half. Substitution, Southampton. Steven Davis replaces Mario Lemina. Substitution, Manchester United. Jesse Lingard replaces Romelu Lukaku. Cédric Soares (Southampton) wins a free kick on the left wing. Delay in match Romelu Lukaku (Manchester United) because of an injury. Attempt blocked. Manolo Gabbiadini (Southampton) left footed shot from outside the box is blocked. Assisted by Pierre-Emile Højbjerg. Attempt missed. Pierre-Emile Højbjerg (Southampton) header from the centre of the box is close, but misses to the right. Assisted by Nathan Redmond with a cross following a corner. Corner, Southampton. Conceded by David De Gea. Attempt saved. Nathan Redmond (Southampton) right footed shot from outside the box is saved in the top centre of the goal. Assisted by Mario Lemina. Mario Lemina (Southampton) wins a free kick in the attacking half. Substitution, Manchester United. Anthony Martial replaces Marcus Rashford. Attempt saved. Pierre-Emile Højbjerg (Southampton) right footed shot from outside the box is saved in the bottom left corner. Attempt missed. Nathan Redmond (Southampton) left footed shot from outside the box is high and wide to the left. Assisted by Jack Stephens. Substitution, Manchester United. Diogo Dalot replaces Luke Shaw because of an injury. Delay in match Luke Shaw (Manchester United) because of an injury. Attempt saved. Paul Pogba (Manchester United) right footed shot from the centre of the box is saved in the centre of the goal. Assisted by Nemanja Matic. Attempt saved. Manolo Gabbiadini (Southampton) left footed shot from the left side of the box is saved in the centre of the goal. Assisted by Stuart Armstrong. Substitution, Southampton. Manolo Gabbiadini replaces Michael Obafemi. Attempt missed. Luke Shaw (Manchester United) right footed shot from outside the box misses to the right following a corner. Corner, Manchester United. Conceded by Maya Yoshida. Jannik Vestergaard (Southampton) is shown the yellow card for a bad foul. Scott McTominay (Manchester United) wins a free kick on the right wing. Attempt saved. Nathan Redmond (Southampton) right footed shot from outside the box is saved in the centre of the goal.